Islamabad (Staff Report/Agencies): Imran Khan, in first address to the nation since being elected as the new premier, has pledged to make the country a welfare state as a model for the State of Medina. 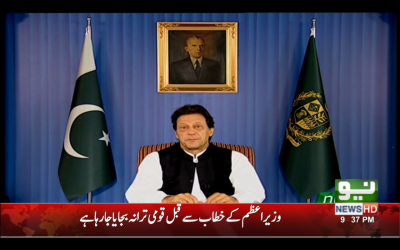 PM Khan first thanked those who stood by him in his political struggle, saying: "I want to thank all my supporters who have been with me on this journey for the last 22 years. I did not want to pursue politics as a career, but as a means to make this country what it should have been. “We want to make Pakistan a welfare state. It is our responsibility to improve the situation of our street children, widows and handicapped. We need to take responsibility for them,” he said. “I have spoken to all of Pakistan's neighbours and improve relations with them. There is a need for peace and without it, we cannot improve the country's situation,” the prime minister added.